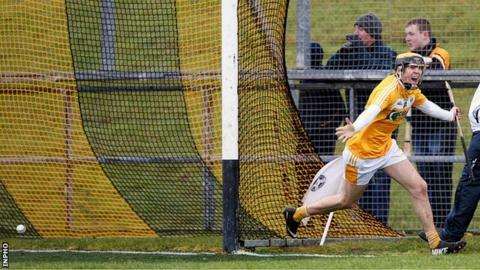 Antrim made it two wins from two Hurling League Division 2A games with a 3-25 to 3-13 victory against Kildare. Jack Sheridan's goal gave Kildare an early lead in Ballycastle but Saul McCaughan netted as the Saffrons surged to a 1-15 to 1-6 half-time advantage. McCaughan completed his double between Kildare goals from Ryan Casey and Gerry Keegan before Ciaran Clarke hit the Lilywhites net to seal the points. Meanwhile, Derry lost 2-11 to 0-13 to Westmeath in their Division 2A match. The Oak Leafers trailed 0-6 to 0-2 at half-time in Mullingar before Alan Devine and Derek McNicholas netted to give Westmeath a four-point win. Antrim scored the opening four points in a blistering start at Ballycastle but Kildare hit back and Sheridan's goal on 14 minutes put the Leinster visitors ahead. It was the only time they led as the Saffrons stormed in front with McCaughan hitting a three-pointer after 23 minutes. Clarke slotted over six points in the first half with Kevin McKernan adding four for the dominant hosts. Casey netted 10 minutes into the second half and it was quickly followed by McCaughan grabbing his second goal of the game. Keegan gave Kildare hope with their third goal seconds later but Antrim were comfortable winners and a late Clarke goal ensured maximum points from two games.